A collective heart-wrenching gasp was heard all around social media on the morning of Thursday, January 29th when we all learned about the passing of our dear friend Elle, of Elle’s New England Kitchen. I had to read and re-read the original post I’d seen over and over thinking that there simply has to be another Elle’s Kitchen on facebook. This can’t possibly be the same Elle I know. Can it? I rushed over to Elle’s Facebook page to make sure that what I had seen wasn’t really true, only to be faced with the horrible realization that it was. Elle was gone. The day before I’d heard of her passing, Elle’s husband Billy had posted this to his Facebook: “Please pray for my wife, Elle. She collapsed and is in the ER. Please pray. I am so scared.” I, unfortunately, hadn’t seen that post until the morning of the 29th. By that time, my prayers were too late. I sat in shock as I tried to take in the devastating news. As the morning wore on, I could not drag myself away from social media. The same place that I’d first become acquainted with Elle, and then ultimately someone I could lovingly call my friend, was the same place I’d gone to mourn her passing and celebrate her life with others who were as sad and shocked as I was. We gathered together and shared stories, cried our tears, stood united together in our loss, and at times, we laughed. And even through such a terrible time, new friendships and bonds were formed. All because of our single love and admiration for one woman who was taken from this world far, far too soon. If you didn’t have the privilege of knowing her, let me tell you a little something about the Elle I knew. I think Elle must have had the largest, kindest heart of anyone I’ve ever known. She always took the time to acknowledge even the smallest of things and would go out of her way to make me feel special with a simple comment or smiley face. More times than not, in the big vast world of social media, it’s been all too easy for me to feel lost and virtually invisible and insignificant. But not when Elle was around! Elle always had a way to make me feel seen and heard, and for that, I can’t thank her enough! I don’t think she knew just how much that little bit of thoughtfulness and kindness meant to me. It was just Elle was just being Elle and the way she authentically cared about other people and their feelings. The major thing that drew Elle and I together as fast friends (beyond our love of food and cooking) was our love for animals. Along with Elle’s huge heart for those of us of the two-legged variety, she held in her heart a deep and abiding love for the 4 legged variety that was beyond comparison. Most each and every day on facebook she’d post things that would either make you laugh, cry or pull desperately at your heartstrings and sometimes all three of those things at once. From videos, pictures, articles, and her ever witty commentary, they were all there to unite us by feeling the same things she was feeling at the time, and to bring us together with our shared love and compassion for all of God’s furry (and sometimes not so furry) creatures. And lastly, before I get to Elle’s recipe, and this post turns into a novel, I’d just like to say how much I always enjoyed Elle’s wonderfully witty, bawdy and well-timed sense of humor. In so many ways I wish I could be more like her in that regard. Elle made me laugh on a daily basis and my life on social media will never be the same. I’m so honored to have had her in my life, if only for a short time. I miss you, my dear friend. Rest In Peace, Elle. In honor of Elle, I did not make any changes to her recipe (except double it and played with the sauce just a little), which happens to be the very last recipe she ever posted on her blog dated November 21, 2013. This was also the first time I’d ever purchased (or tried) Elle’s beloved Woodchuck Hard Apple Cider. I know how big a fan Elle was of this particular product so it only seemed fitting that I chose this recipe of Elle’s to make and enjoy as my #ElleAPalooza tribute to her. Well done Elle! This recipe is one I shall make time and again. *Lifting up my bottle of Woodchuck Hard Apple Cider* Cheers to you Elle!!! 1 package bratwurst, that you’ve pierced a few times, with the tip of a knife. 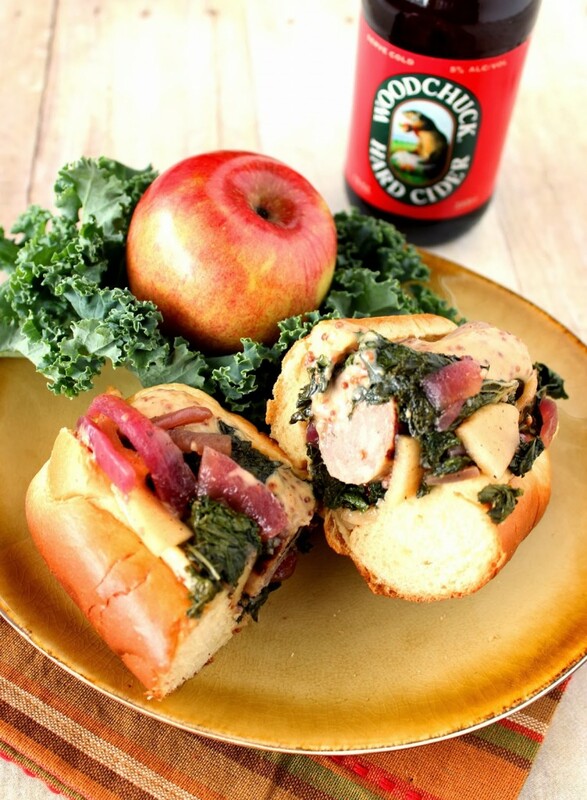 -In a large Dutch oven, bring the hard apple cider to a low boil. Add in the pierced bratwurst, reduce to a simmer and allow them to cook for about 12-15 minutes. Remove the brats and set aside. Discard the hard apple cider and wipe out the pan. 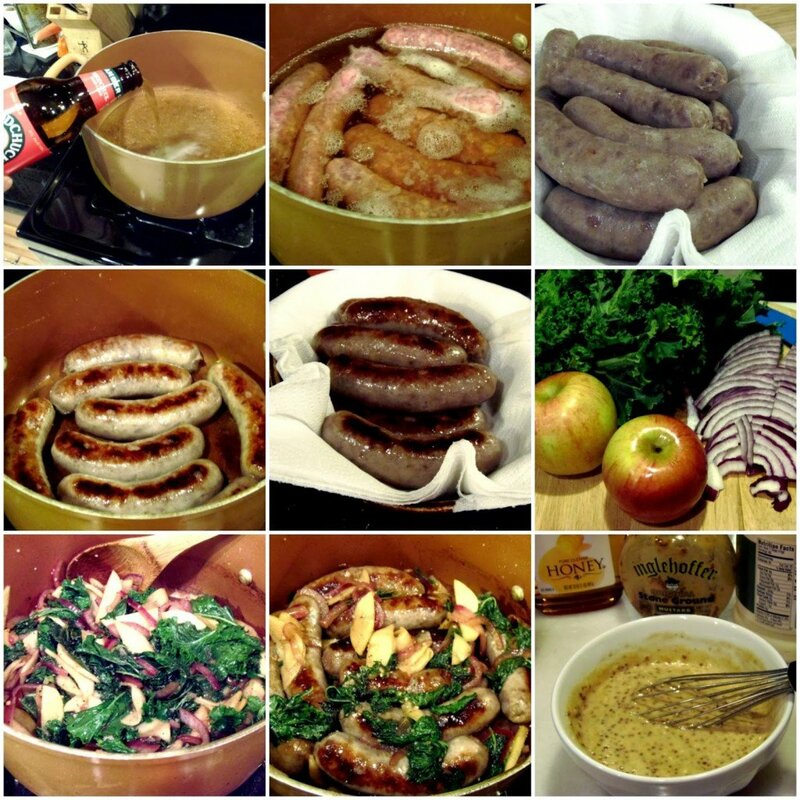 -Add the canola oil to the pan and over medium/high heat brown the brats on all sides. Remove the brats and once again, set them aside. -Reduce the heat to medium/low and add the onions and apples. Cook, stirring occasionally until the onions and apples just start to become tender. -Add in the kale, garlic, salt, pepper, cinnamon, cloves, honey and vinegar. Stir to combine and cook until the kale has wilted down considerably. -Add the browned brats back into the pot and simmer on low for an additional 3-5 minutes. -Meanwhile stir together the sauce ingredients. 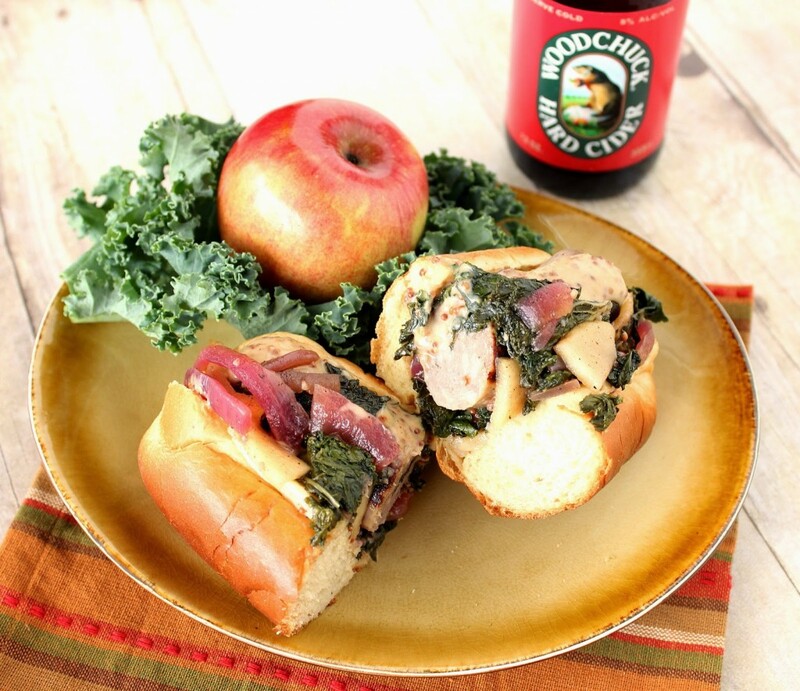 -To serve, liberally spread some of the sauce onto a brat bun, add some of the apple-kale-onion kraut and top with a bratwurst. One last thing I simply have to mention before coming to a close. Elle had recently started her own jewelry business before her passing and had a shop on Etsy. Many times Elle would also post her creations to facebook in order to generate interest and sales. One day she’d posted a picture of this bracelet, and I immediately knew I had to have it. Shortly after that, Elle designed some special pig earrings just for me (she and I shared a unique love of pigs) that coordinate wonderfully well with the bracelet I fell in love with. I wear them often, and especially now they hold a very special meaning and place in my heart. 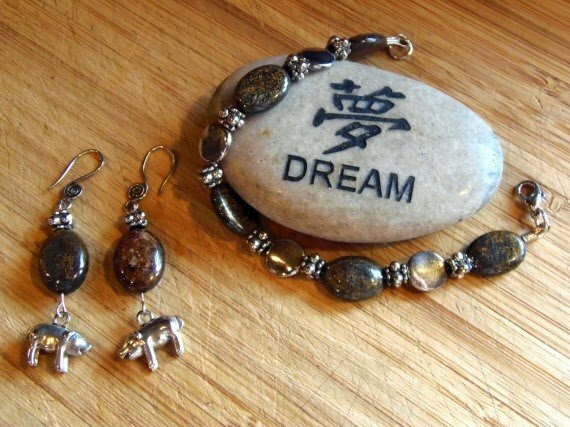 If you would like to also own a piece or two of Elle’s jewelry, an upcoming auction will be held where you can bid on your favorite Elle creations. Please check out the links below for the pertinent information, and also where you can go to donate to the family to offset their expenses at this terrible time. 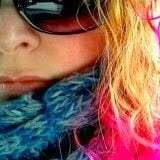 A Friends of Elle page has been set up on Facebook where you can pay tribute to Elle, share links to the recipes you make, and also find links to donate to the family and the upcoming auction (more info on that as it comes available) to raise additional funds to continue to help Elle’s family in this time of need. For anyone who might be interested, I am donating 2 custom painted glasses to the auction (a $70 value). The design can be totally your call, and you can choose from either a set of wine glasses or a set of coffee mugs. There are also lots of other incredible items being auctioned off, such as signed-by-the-author cookbooks and other amazing products and services, so don’t forget to mark your calendars and join in on the action. This is something you won’t want to miss! Rest in peace, Elle! You will be forever missed, but never forgotten! These looked yummy when Elle made them and now with twice the photos and twice the raves I will have to make these. I wonder how kale chips would taste on it? Mmmm! Elle is going to be so missed by so so many. She touched a lot of lives with her kindness. I know my life was changed. The brats look delicious, Elle was well-loved and will very much be missed. A beautiful tribute Renee. My thoughts and prayers go out to Elle's family and friends. A lovely tribute Renee; she was a doll and it's been almost heartbreaking to read each story of friendship and loss. This will pass and one day soon we can just think of our friend with love and joy. I miss her; it still seems so surreal but soon I'm hoping the memories will bring a smile instead of tears.